But UK based Renishaw entitles the topic “Additive Manufacturing”: they have appointed Clive Martell, former President and CEO of Delcam, to a new role entitled ‘Head of Global Additive Manufacturing’. Martell, aged 54, progressed from being a graduate recruit to become CEO of Delcam plc, where he successfully managed the company’s transition from an AIM (Alternative Investment Market) company to an operating division of Autodesk. After his appointment as Delcam’s CEO in 2009 his successful track record of delivering strong revenue and profit growth earned him the CEO of the Year Award at the 2013 Grant Thornton Quoted Company Awards, another qualification to add to those such as his MSc, CEng, and MIET. 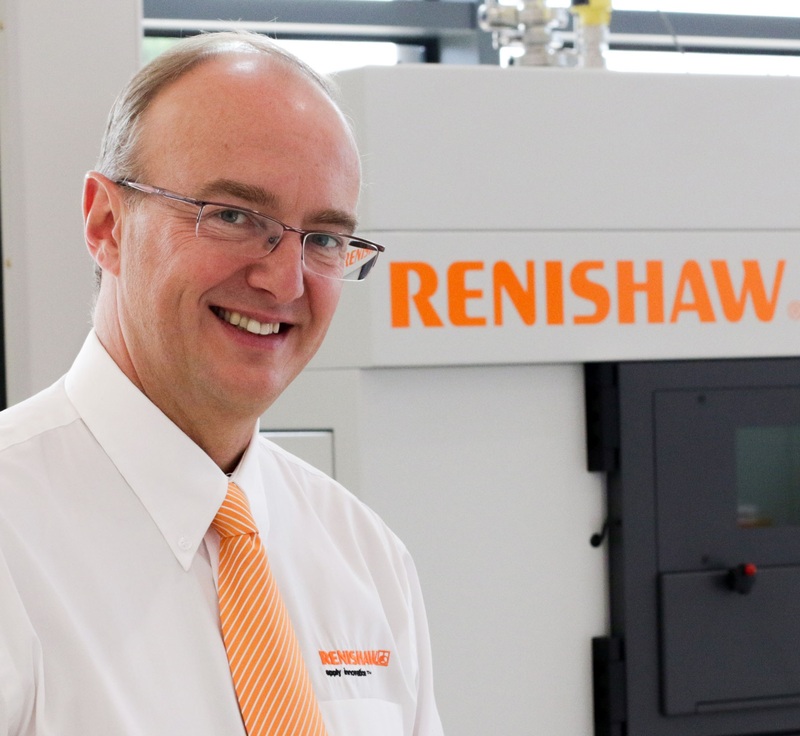 In this new role at Renishaw, Clive will report to Geoff McFarland, Group Engineering Director and will be responsible for the strategy and direction of additive manufacturing across the Renishaw Group. He will liaise with development teams in the UK and sales and marketing operations across the world and will be particularly focussed on making a global success of Renishaw as an additive manufacturing (AM) solutions provider. Renishaw is a world leading engineering technologies company, supplying products used for applications as diverse as jet engine and wind turbine manufacture, through to dentistry and brain surgery. It has over 4,000 employees located in the 32 countries with wholly owned subsidiary operations. Sales for the year ended June 2014 were £355.5 million – of which 93% was exported. Yes, that’s 93%! The company’s largest markets are the USA, China, Germany and Japan. Throughout its history Renishaw has made a significant commitment to research and development, with historically between 14% and 18% of annual sales invested in R&D and engineering. The majority of this R&D and manufacturing of the company’s products is carried out in the UK, where due to strong growth it currently has over 100 vacancies. Do you remember the Science Museum exhibit of 3D printed components in a metal, maybe aluminium, as reported in the INSIDER some three/four years ago? Or maybe you visited the Museum and saw it? I think the item on display was part of a carburetor. But what is making Clive Martell look so pleased? It’s either the job, or the component in his hands, which looks like a filter element? I will try to find out, but you can guess? See the pic below. 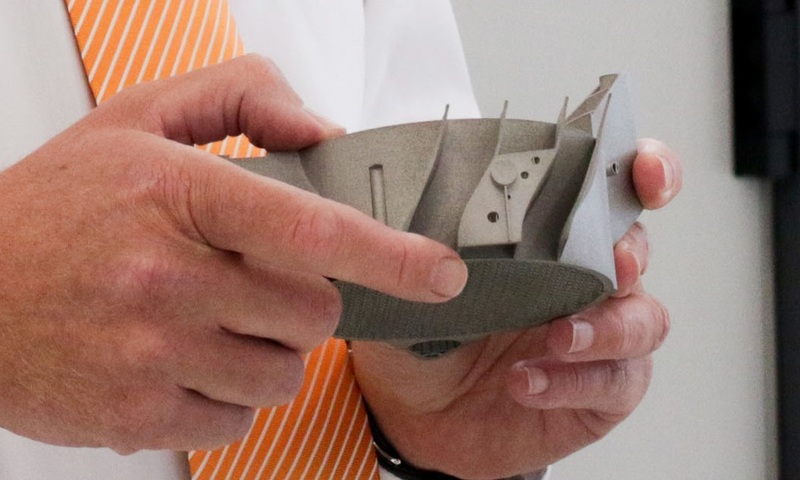 So the answer is, that this is just an example part, produced to highlight the skill and various different capabilities of additive manufacturing. It includes a fine mesh, a conformal cooling channel and a blade structure visible on the outside. They chose to make this piece out of cobalt chrome: any other metal alloy can be used used in additive manufacturing.